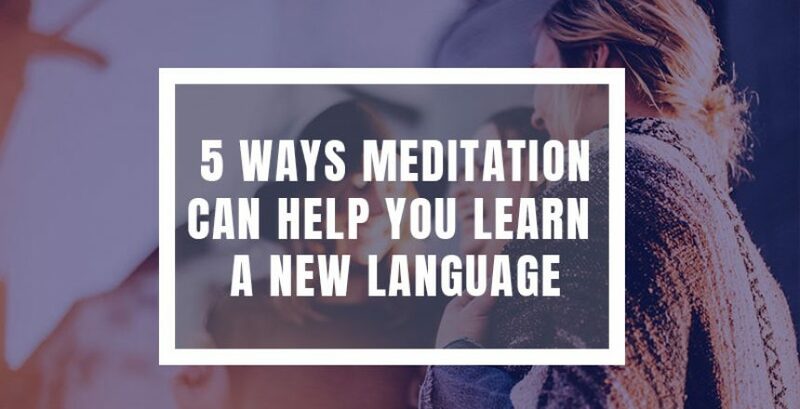 Meditation has a lot of mental and physical health benefits, but did you know that it can also help you learn a second language, like Spanish? Learning a new language requires practice, discipline, and skills. But learning a language is actually only 20% skill. The other 80% is mindset. The mind plays a fundamental role in learning, and it’s important to know how to train it and keep it strong. One of the best ways to strengthen your mind is through meditation and mindfulness. We may hear with our ears, but we listen with our minds. The main enemy to this isn’t our lack of skills, or external noises. It’s the mind itself and the thoughts that never seem to stop. This becomes inner noise that’s so loud it takes you out of the present moment. This is what meditation does: it quiets the mind and helps eliminate the inner noise. It’s normal for the mind to have thoughts crossing along constantly. For beginners of meditation, shutting that off isn’t quite that easy. But over time, we can help quiet those thoughts and undo any attachment to them. This is how meditation creates mindfulness within us. The best part is, you don’t have to be sitting in a specific pose to meditate and practice mindfulness. You can do it anywhere: before class, on the train before work, during your lunch. The point is to create a daily meditation practice that helps you strengthen your mind and quiet the inner noise, so you can focus and find your motivation. Sometimes what stops us from being able to concentrate and be more proficient is anxiety and unsolved emotions. We focus too much on our worries or let our thoughts linger on the negative things in our lives, which are usually matters of the heart that need to be solved. Practicing meditation increases your emotional intelligence, easing your capacity to handle difficult feelings and let those emotions flow easier. Meditation also allows you to gain greater self-awareness, which helps you be more creative so you can learn a new language in a way that is comfortable for you. When you are stressed, you feel it physically just as much as you do emotionally and mentally. This is why most people are tired and lethargic when they have high levels of stress. The amount of energy your body uses during stressful times is astounding. That’s energy that the brain could easily use to process information efficiently, and stay connected with the present. Meditation helps to reduce stress levels, which gives you more energy. When you meditate, you lower your blood pressure and become more grounded. Through other tools, like mindfulness and visualization, you are able to let go of things that have caused anxiety in your body. By reducing this stress, you are easing the mental and physical strain your body was feeling, You find an inner sense of calm, and you can actually feel lighter. This lightness helps make space for the good things you want, like learning to speak Spanish with confidence. Nowadays, too much information creates a challenge for the mind. It requires a lot of extra energy to deal with. This is why most people find themselves going down the rabbit hole and getting easily distracted when they’re doing something normal. So if you’re already easily distracted, it’s harder to be focused on learning a second language. But creating a daily meditation practice helps you to be reprogram your mindset so that you are motivated and resilient in your desire to learn. You also gain the mindfulness to let go out of the “noise” and overload of information that serves to distract you. Once mind learns how to keep quiet and you find an inner calm, the brain is ready to give all of its power for your purpose. Meditation provides a sense of mindfulness that creates balanced emotions. And having emotional balance allows you to feel more passion toward what you’re learning. A daily meditation practice provides peace of mind and allows it to become a habit for your brain. So when you’re class or in a session, you are motivated and focused on practicing the language and having real conversations with people. Studies have shown that meditation and mindfulness can help boost cognitive function, and have even been shown to have anti-aging benefits for the mind. It can also increase your ability to pay attention longer. When you incorporate a daily meditation practice, you can also improve visuospatial processing, which is how you see objects when they are shaped and arranged a certain way. Since so many students learn visually, this can play a key role in learning languages, especially when you use tools like flashcards and gamification apps. Learning a second language doesn’t have to be difficult, and with a daily meditation practice, it can be even easier. 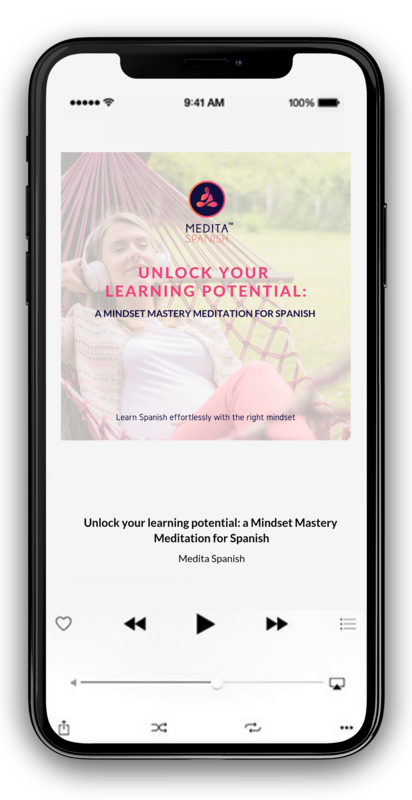 Make sure to like our Facebook page to find out more about how we use meditation to help you learn Spanish.